This great stuffed jalapenos recipe was submitted by our friend at Quick-and-Easy-Dinner.com. It works beautifully on a grill and is easy to make. You can find out about more great quick appetizers at their Easy Appetizer Recipes page! This stuffed jalapeños recipe is my all time favorite spicy appetizer! The easiest way to cut your bacon strips in half is to do it in the package. Don't open the bacon, just take a large knife and cut the package in half cross-wise, therefore cutting the bacon strips in half. Soften cream cheese to room temperature or unwrap and put in microwave for 20 seconds. Stir in garlic powder. Make sure you work it into the cream cheese so that it's all garlic flavored. Rinse your jalepenos, cut top stem off, and then cut in half lengthwise along one side, creating a pocket into the inside of the jalapenos. Use your knife to de-vein and de-seed each jalepeno. The vein, which is the lighter colored inside part where the seeds are, is what makes the peppers hot. The more vein you leave, the hotter the finished product. To get the mildest flavor, take a spoon and scrape the vein to leave just the darker inside. This sounds time consuming, but it goes very quickly. *Hint: If you have some kitchen gloves or plastic gloves, you may want to put them on. If the peppers are really hot, even after washing your hands, the heat remains on your fingers and can burn your eyes or any other sensitive places you touch. If you don't have gloves, use a spoon for the de-veining and de-seeding and try to handle the inside of the pepper as little as possible, while washing hands thoroughly and quickly after finishing. Take a spoon and fill the inside of the peppers with the cream cheese mixture. Fill them full but not overflowing because the mixture expands as it cooks. Take the half slices of bacon and wrap around the stuffed pepper. I like to wrap end-middle-end around it, but you can wrap around the middle and double over holding the bacon together with a toothpick. 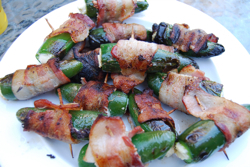 On your grill, cook stuffed jalepenos on the second rack, if you have two tiers. If you only have one level or if you’re cooking on charcoal/wood place a piece of foil down on the grate, then put your peppers on top. Cook until the bacon is done! **Note: This recipe can also be cooked inside a 425 oven if desired. This stuffed jalepenos recipe is well worth the effort! Of all the appetizers I make, these are the first to disappear and there are never any left (regardless of how many I make!). Enjoy This Stuffed Jalapenos Recipe! Done with the Stuffed Jalapenos Recipe?